Our floor stock model is covered in heavy duty linen-blend fabric. The seat cushions are high-resilient foam with a tetron wrap, and the back cushions are filled with a combination of feathers and pearl-ball. The seats feature metal tension springs on the Southland Beech frame. Our model has a light coloured wooden tapered leg. 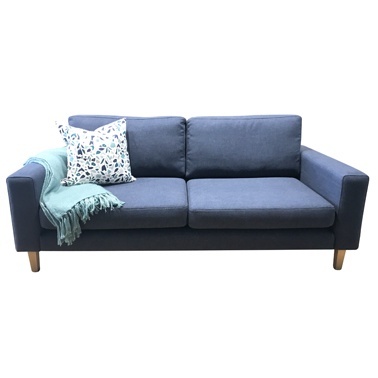 We can make any size to order, and the dimensions, fabric, cushion fill, and legs are infinitely customisable, including a corner unit and chaise.